Are you familiar with Where's Waldo [or Where's Wally outside the US and Canada]? That's the image that comes to mind when I think about how to get found online, especially locally. The point about getting found online is that you want to be sufficiently different from all of the other similar listings so you stand out. 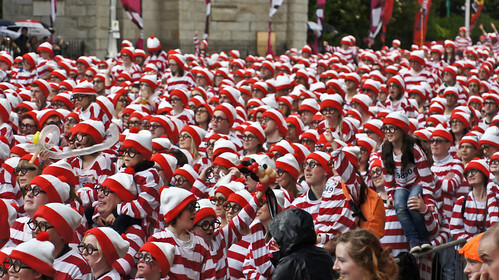 Unlike Where's Waldo/Wally, those searching online aren't as patient or as delighted with the painstaking search process. That means that you must stand out by being relevant to your potential customers. How then to stand out locally? Consider Google Places! I mentioned several suggestions in Improving Visibility Online: Advice for Businesses - including using Google Places (aka Google+ Local). 3. Add details to your listing description. Key sure to include keywords that are important to your business and a link to your company website. 4. Add images and photos. Photos add a lot of dimension to a Google Places listing [not too dissimilar from the effect they contribute to a Facebook Fan Page]. 5. Keep track of reviews. About reviews, you can publish public responses to your reviews - both good and bad ones. That means you can tell your side of the story and thank your fans. Note, too, that you can post updates to your profile, as well as coupons and special offers. You can also monitor analytics! How franchises can tap the power of Google Places mentions Domino's Pizza as an example of an effective Google Places listing. When all search is local offers perspective on how to be included in the "local 10 pack and 3 pack" search results. Hint: it's more of the basics. For additional ideas and suggestions on how to get found locally, read The Ultimate Guide to Online Marketing for Local Businesses. For an intense look at Local SEO I recommend Local SEO Guide Andrew Shotland, and more specifically How To Do Local SEO for your Website in Five Minutes. What successes have you had with Google Places? Has it helped you get found online locally? What about reviews? How have you dealt with them?